The Loi Krathong festival dates back to the time of the Sukhothai Kingdom (Thailand), about 700 years ago. It marked the end of the rainy season and the main rice harvest. It is based on a Hindu tradition of thanking the water god for the waters. Several Buddhists temples in Malaysia are organising the Loi Krathong Festival in Malaysia. 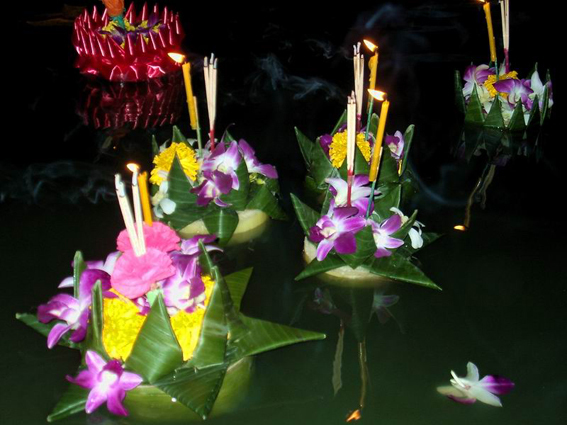 Loi means to float and Krathong is a leaf cup normally made of banana leaf, which is lotus-shaped. 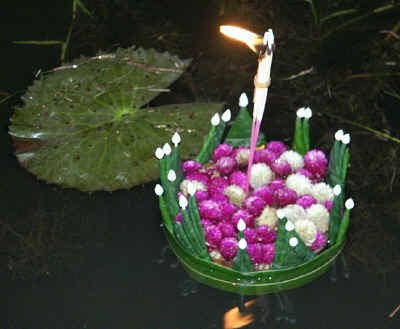 Usually the Krathong has a small coin in it, besides a candle and incense sticks. 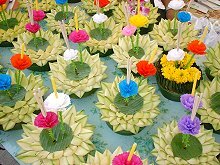 Nowadays most people buy a colourful krathong from a vendor. Locals make their own, but you can buy one from one of the vendors who capitalize on the festival (also, magicians set up stages and food vendors pull out the goods). Fill your krathong with a candle, flowers, incense, and a coin. Sometimes, locals add a snip of their hair or fingernails to the krathong (so that a part of their bodies goes out to the goddess). Locals wear beautiful costumes, so stop by a vendor and get one for yourself. The night of the full moon of the twelfth lunar month (usually in mid-November) is the time of Loi Krathong. In the evening, when the full moon begins to rise, people carry their Krathongs to the banks of waterways. After the candle and incense sticks are lighted, the Krathong is pushed gently out onto the surface of the placid water. A few folk will raise their hands in worship. Under the full moon, countless krathongs float on the rivers and lakes. They watch the Krathong as it floats sluggishly along until it is out of sight. 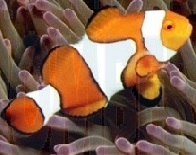 They believe that with the floating away of a krathong, the accident drifts away from them. The burning time of the candle and the distance covered by the krathong determine happiness for the future. The krathong is a sacrifice to Phra Mae Khongkha. Mae Khongkha is the holy mother of the water. They do this to honor her and to ask her for forgiveness for the sins they committed. Mostly the Loi Kratong Festival is organised by a Siamese Association. It's celebrated in Perlis, Kedah and Penang and Kelantan. �This is the first time the Loy Krathong celebrations will be held at the Reclining Buddha Temple, instead of Wat Buppharam in Perak Road as in previous years. This is because of the large number of tourists who visit this temple, especially now, which is the school holidays. A fair promoting Thai food would be held during the celebrations. We are expecting about 4,000 people for the procession, which begins at 10.30pm from the temple to Gurney Drive. Devotees could buy krathong priced at RM15 and RM30 each at the temple, adding that there was only a limited supply of 500 krathong this year."